A number of things happened last night that were quite remarkable. 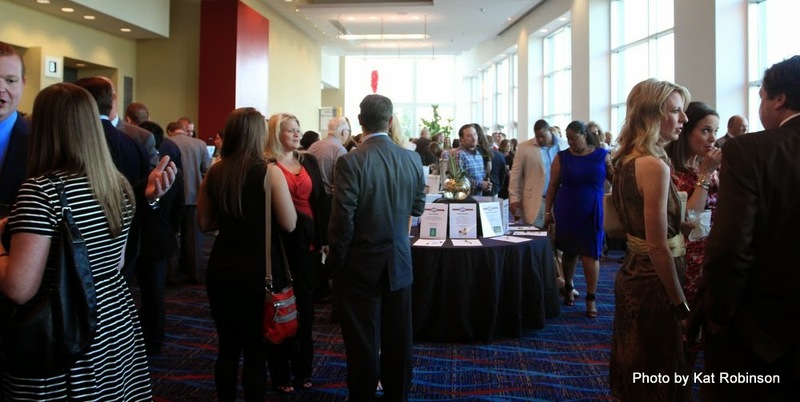 Nearly 600 people gathered to fete and celebrate at a celebration benefiting Pulaski Technical College's Arkansas Culinary School. 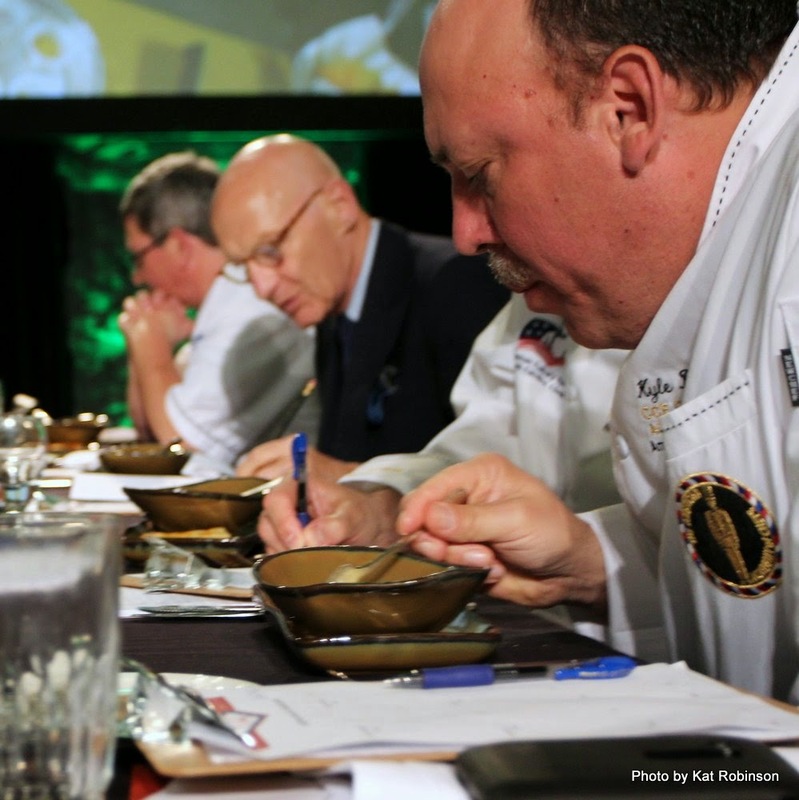 Two chefs faced off for the Diamond Chef title. 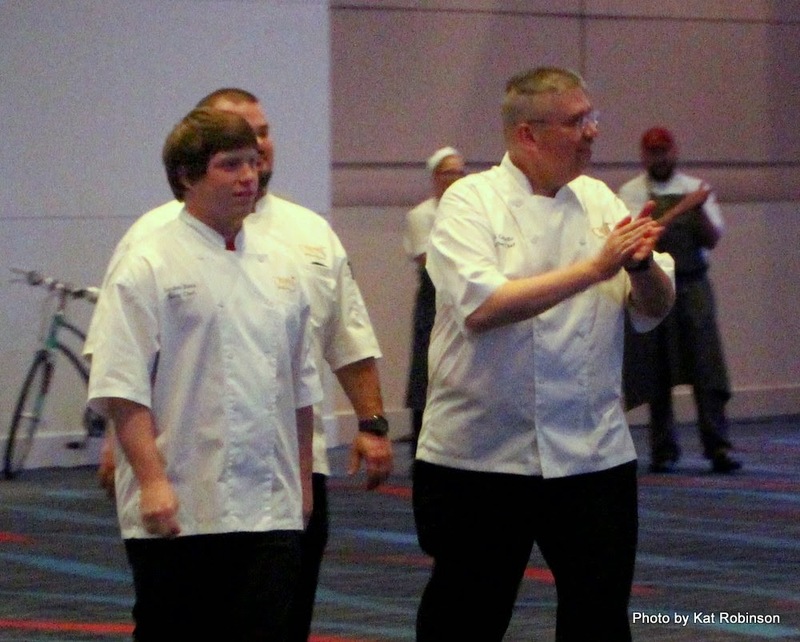 Dozens of students and culinarians let down their hair and put on the dog for the evening. And a select group of bloggers got together and did what they do... what we do. 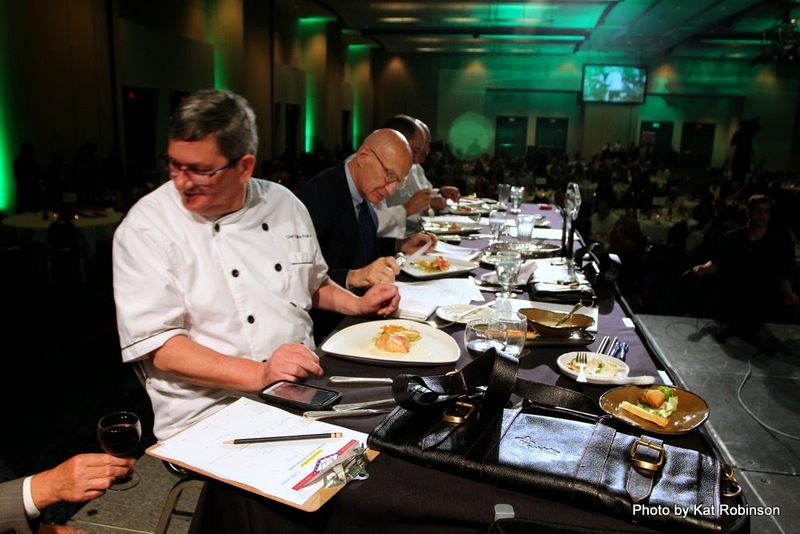 The 7th Annual Diamond Chef Finals are more than just two chefs and their sous chefs competing before a panel of judges. 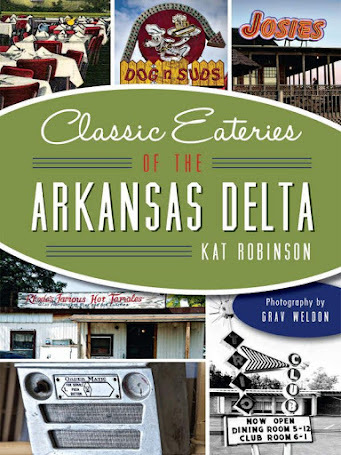 It's a chance to honor cooking here in Arkansas and to party just a bit. 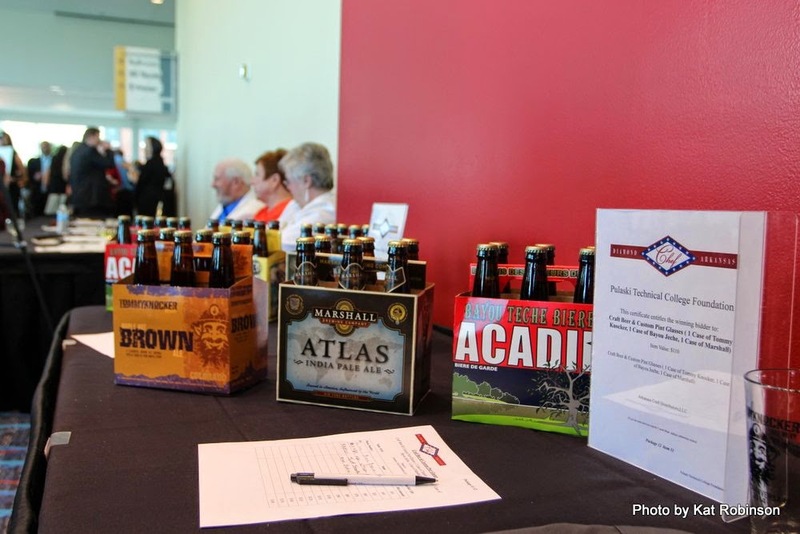 That celebration began early in the evening with a reception and silent auction -- featuring a craft brew bar and lots of neat and interesting items... which is all well and good, but it's also a chance to socialize with a huge group of foodways supporters. The crowd was thick. 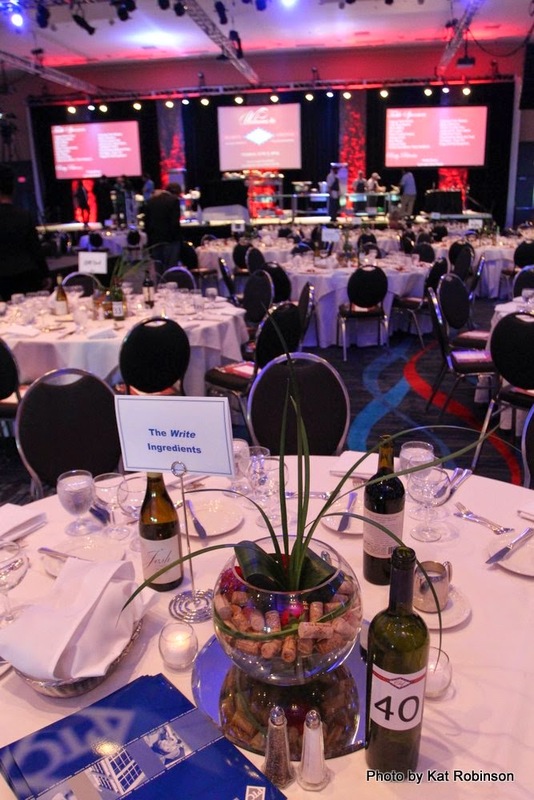 Once the doors were opened, tables were filled and the first of three courses were served. 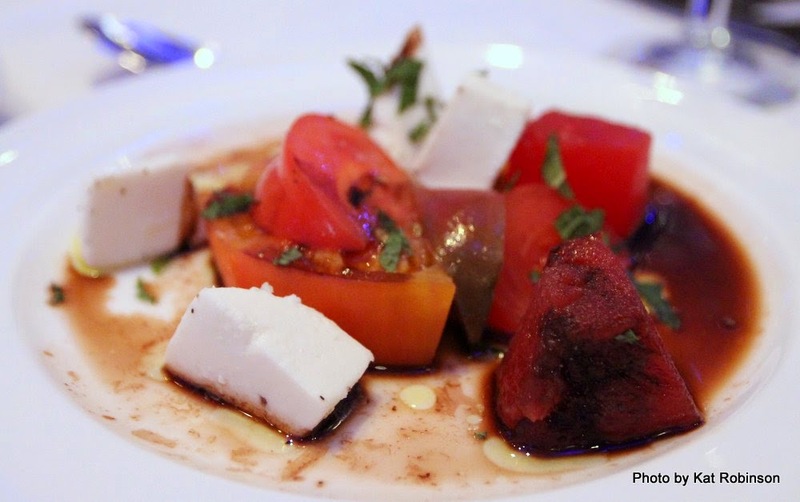 The first, a refreshing fruit salad, featured heirloom tomatoes and compressed watermelon with mozzarella and a balsamic reduction... and mint. And here's a picture of it. What you don't see here but will find on the blogs of my dining companions are the photographs -- of Southern Ash's Joel DiPippa and his lovely wife Amanda, Dining With Debbie's Debbie Arnold and her husband Gary, Rock City Times satirist Greg Henderson, Red Kitchen Recipes writer Thanh Rasico, the original Fancy Pants Foodie herself Christie Morgan Ison and Monika Rued of the Arkansas Times -- who, dear readers, used to co-produce Today's THV This Morning with me a (cough) decade ago. Frankly, I'm not much of a people-photo taker. 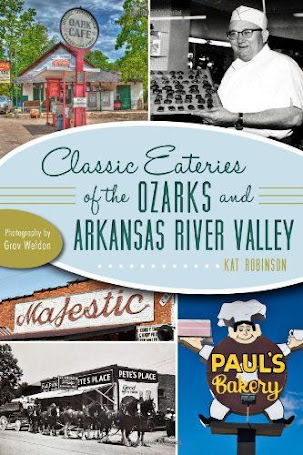 I have to work up my gumption to appear in photos sometimes myself -- food is so much easier to shoot (my regular traveling companion, Grav Weldon, was already on the way to Wakarusa). We were all afforded the privilege of attending this august event pro bono... and what a gift that was. Over wine and iced tea we chatted before the festivities got underway, catching up here and there and hearing about the efforts of our peers. It was great to be in such company. The reason we were there, of course, was on the stage, and soon we had announcements. 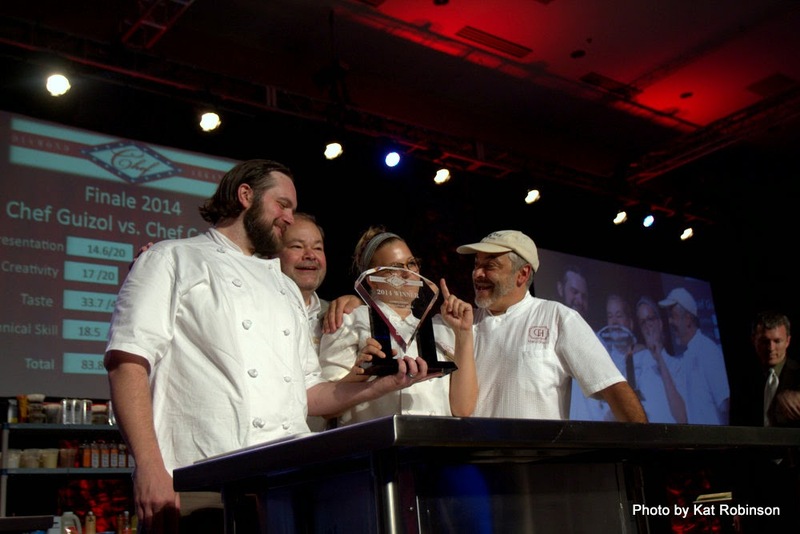 First came Chef Dan Capello of Chenal Country Club, who strode into the hall with his sous chefs with an air of pride. 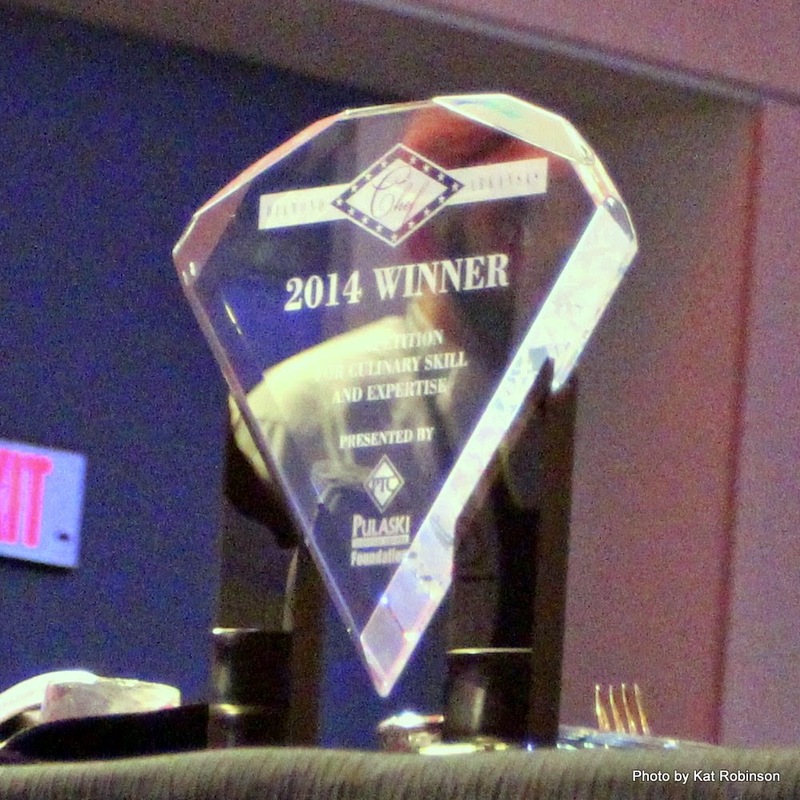 It's deserved; Chef Capello won both the 2010 and the 2013 Diamond Chef titles. 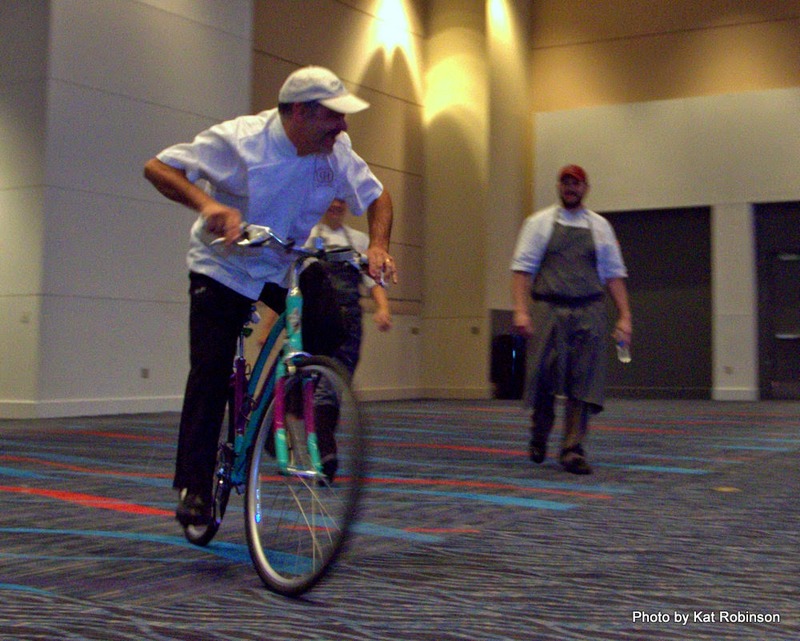 He was followed a few minutes later by Chef Marc Guizol, who flipped tradition by entering on a bicycle! Chef Guizol is right-hand to The Capital Hotel's Chef Joel Antunes and a pretty great cook in his own right. 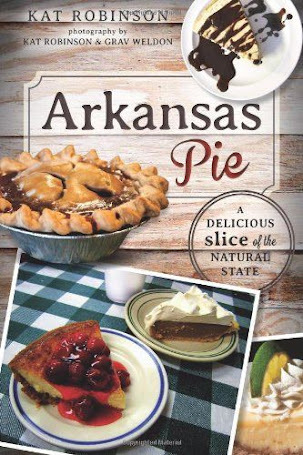 He happened to win the Arkansas Hospitality Association's Iron Chef competition last September. 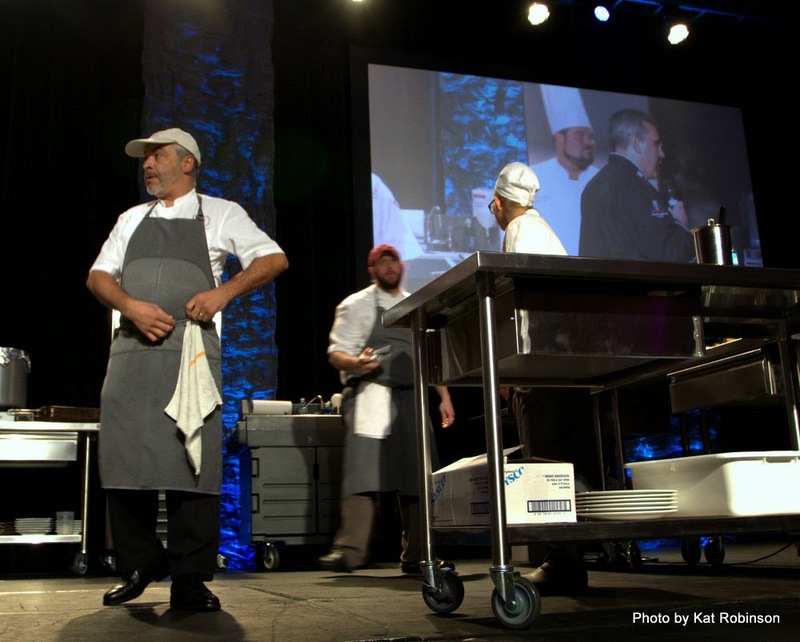 The two teams took their spots on the stage, and after introductions were made, Chef Todd Gold took the stage. 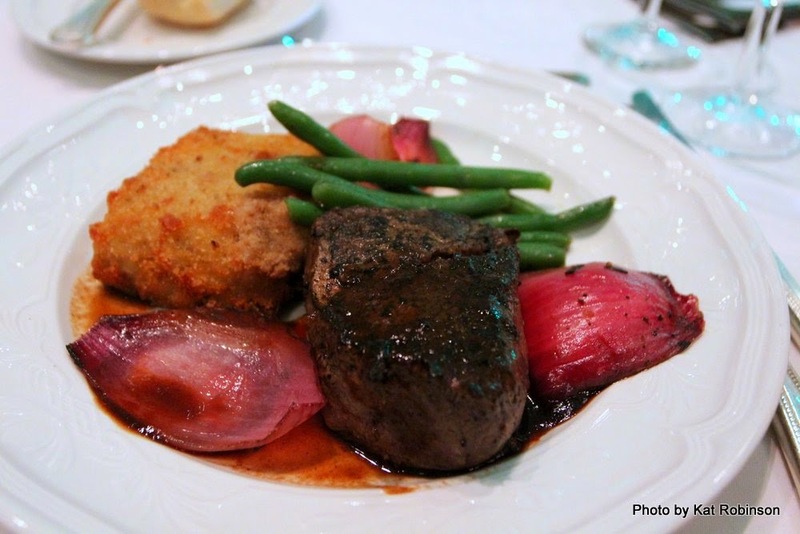 Chef Gold is dean of Pulaski Tech's Culinary Arts and Hospitality Management program. He announced the chefs and called them forward, asking them to choose their best sous. Then he announced the twist for this year -- those two sous chefs were going to flip teams! 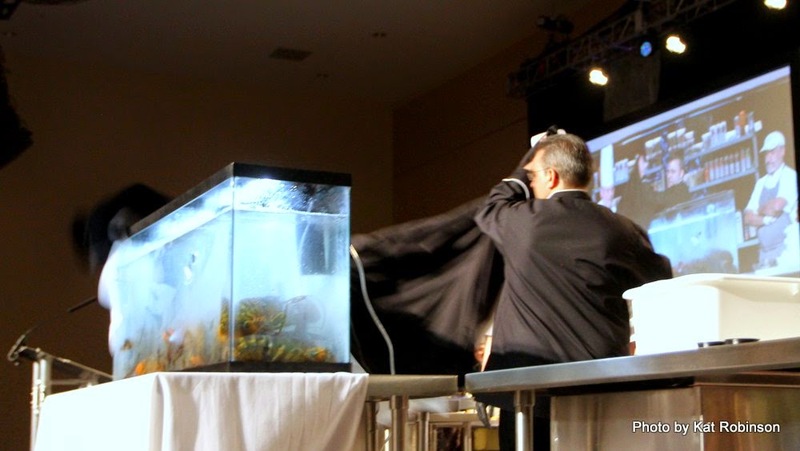 The two chefs immediately got to pulling the crustaceans out of the big tank, took them to their respective stations and began dispatching and preparing them for what was to come. They had 15 minutes for the task. The evening's two commentators, famed local dining star Pam Smith and local radio personality Kevin Clay, introduced the panel of esteemed judges -- Chef Kyle Richardson, vice president of the American Culinary Federation Central Region; Chef Jeff Bacon, vice president of the American Culinary Federation Southwest Region; Chef Andre Poirot of the Little Rock Crown Plaza; and Chef Paul Bash, first president and member of the Arkansas Chefs' Federation Hall of Fame... and of course, the executive chef of the beloved Jacques and Suzanne's. 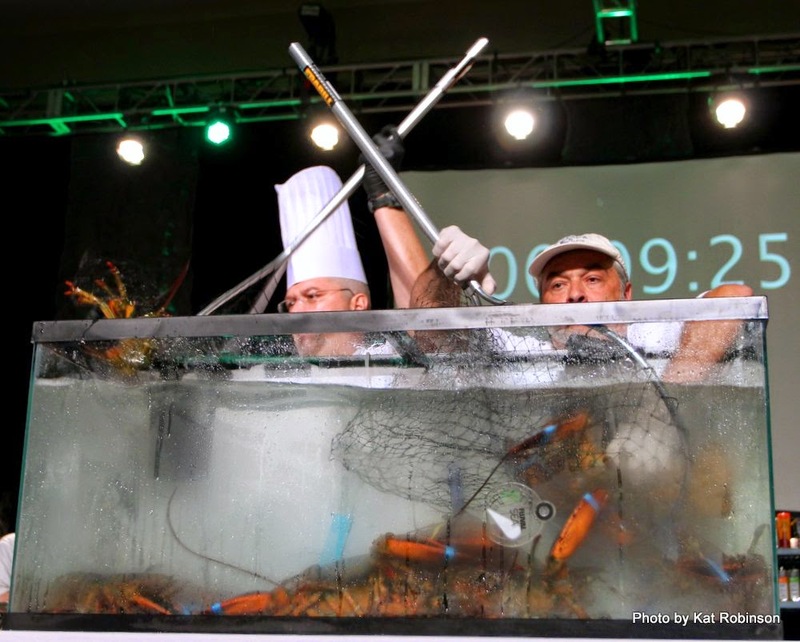 Soon time was out, and the 20 minute countdown began for the chefs to create an appetizer from lobster. While they worked, we dined on Creekstone beef and green beans, something called crispy potato gratin and a demiglaze... and rolls, yeasty ones and potato ones too. Our conversations were interrupted by our Twittering; at one point I counted six phones out at the table as we each tried to share out what was going on to our respective fans. On the stage, hubbub was happening, and those 20 minutes passed quickly. Dishes went quickly to the judges. Chef Dan Capello's creations, which appeared to originally be ravioli or tortellini from our seats towards the back of the house, turned out to be lobster spring rolls, delicately fried and served with a dollop of lemon-tinged sour cream. 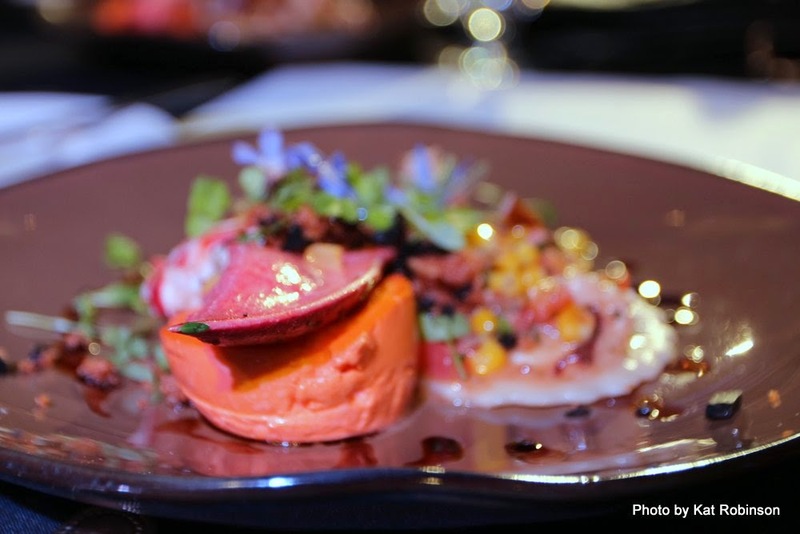 Chef Marc Guizol's submission was a lobster tartar bedecked with microgreens and cream, served with a peanut sauce drizzle. 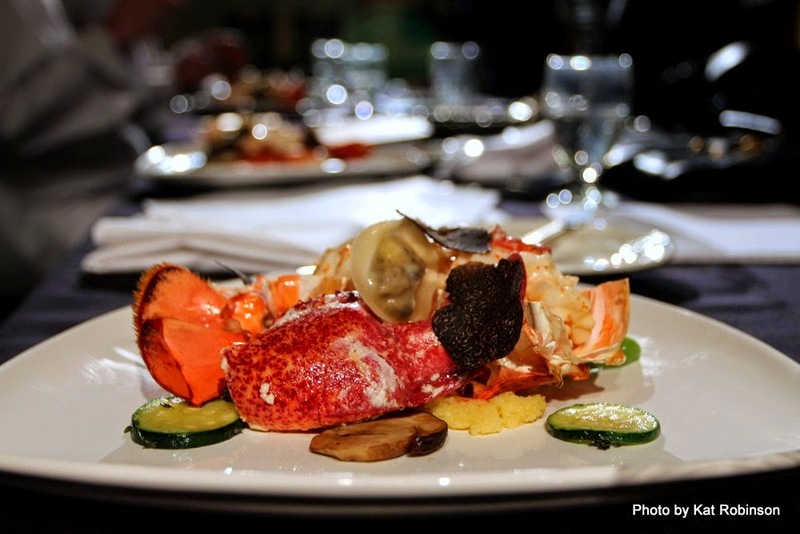 The clock was restarted again, another 20 minutes for the chefs to come up with a main entree featuring lobster. 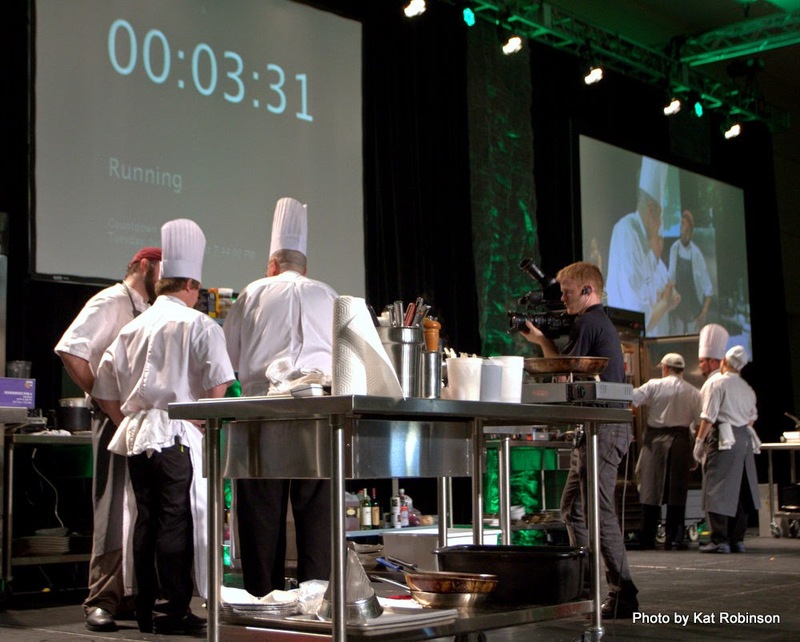 By the way, each chef was allowed to bring 10 ingredients of their choice and 15 kitchen implements to assist them in their efforts -- along with their sous chefs, of course. Kevin and Pam cut it up on the stage with their enthusiasm. However, we were duly entertained at our own Alton Brown-esque commentator with Joel's witty reparte about the actions of the chefs, and his insight into different ways lobster might be prepared. We discovered we had a mutual affection for the old Japanese version of Iron Chef. Greg Tweeted out again over a "second fight between the chefs," and Monika was all into grabbing a selfie with me. Though it was loud in there, we managed to converse quite a bit. There were other things going on... including the draw for a raffle in which the winner got their choice of silent auction items (no matter the winning bidder!). The wine pull was also mentioned, and several folks from our table went to check on bids and to engage in raffle ticket-purchasing and wine... pulling? I guess that'd be the verb I'm looking for. 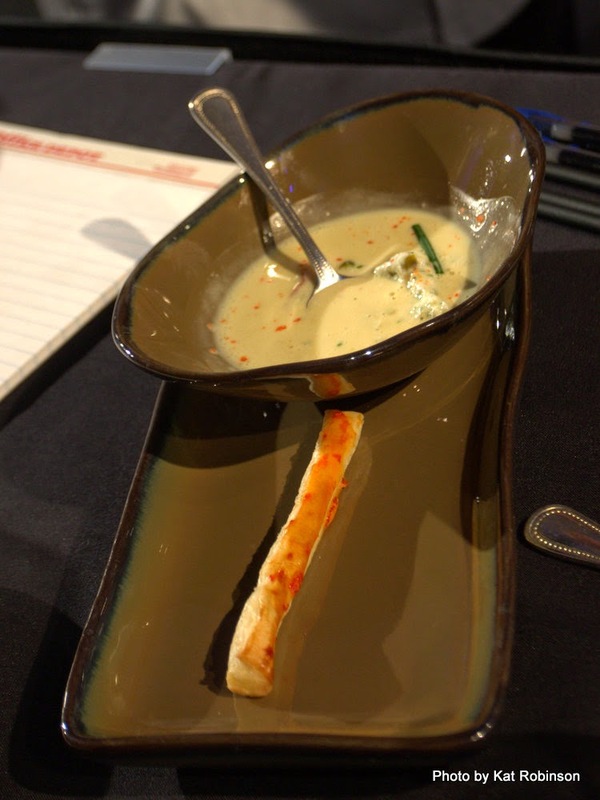 Chef Guizol offered a coconut soup with lobster tail and lobster cream, garnished with lobster roe and served with a roe-studded crackerish breadstick. 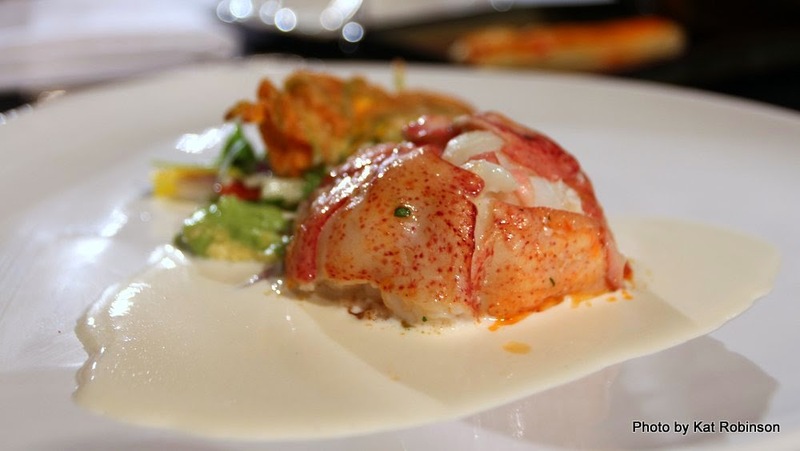 Chef Capello countered with lobster tail over guacamole slaw, served with a goat cheese-stuffed zucchini flower. 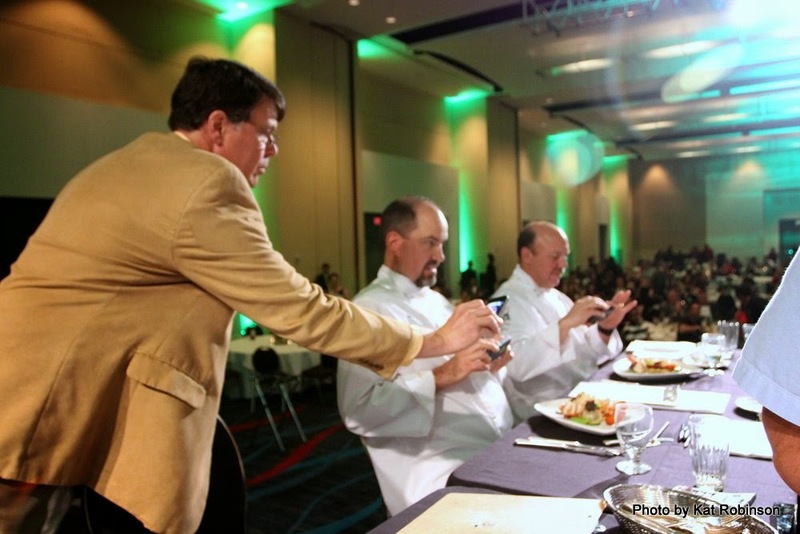 Those of us who rushed the stage to get shots of the activities were amused by the judges themselves, who also pulled out their phones to photograph their food! 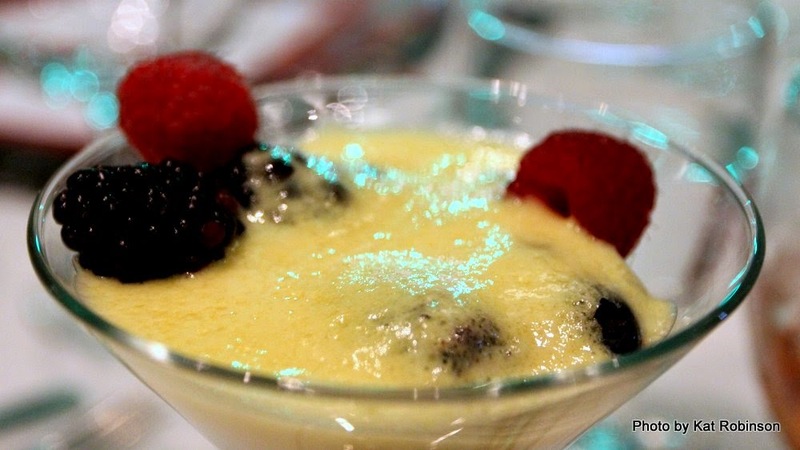 As the entree was presented, dessert came to our table -- a light and elegant champagne sabayon with fresh berries served in martini glasses. The champagne was strong with this item, but it was light and barely cloying. Still, there were calls for more wine from my dining companions, who like other diners went to scavenge bottles from other tables. Coffee was discovered and a waitperson accosted for the java accoutrements. Well into the last 20 minutes. we chattered on, lubricated by liquor and excitement and caffeine. I felt at home here. I also relished my boots, which allowed me a quick arrival to the stage at each development. Yes, I was underdressed, but I was ready to tackle the world. The final course complete, desserts were presented to the judges. Chef Capello delivered... well, it was... colorful. I could see a lobster claw and a whitish cream and corn and flowers. 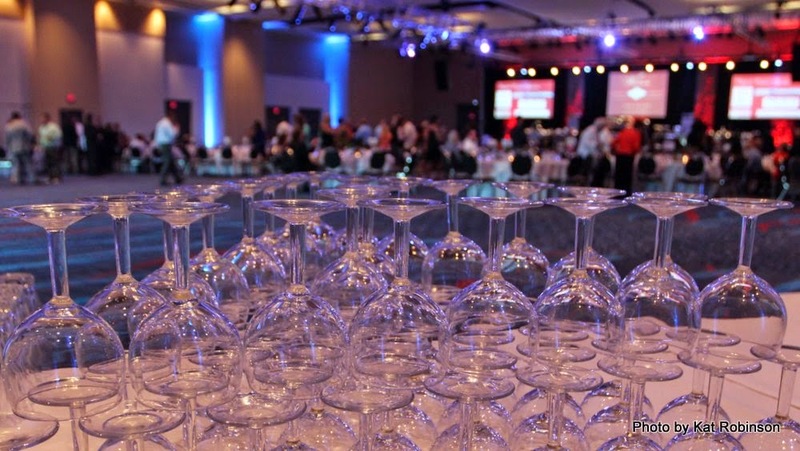 I could not hear the description of the dish, the crowd having grown louder as time had progressed and the cash bar at the back of the room gradually depleted. Christie heard it, though, and related on her blog: "crab claw and knuckle ragu with mushroom, tomato and bacon; a corn and lobster flan; and a celeriac, French truffle and quail egg yolk ravioli with a celeriac truffle crumble, garnished with thyme, celery and borage flowers." Yeah, I would never have managed all that. Chef Guizol's delicacy? Smoked lobster claw with caviar-styled lobster roe, an Australian truffle ravioli and porcini mushrooms. I would have given all the money in my wallet to eat that. The dishes all presented, the judges retired to discuss the decision and the auctioneer took the stage, offering for bid one grand vacation and fantastic dinner after another for bid. Us bloggers huddled in the back. The auction and judging seemed to take quite a while and the crowd began to get restless. 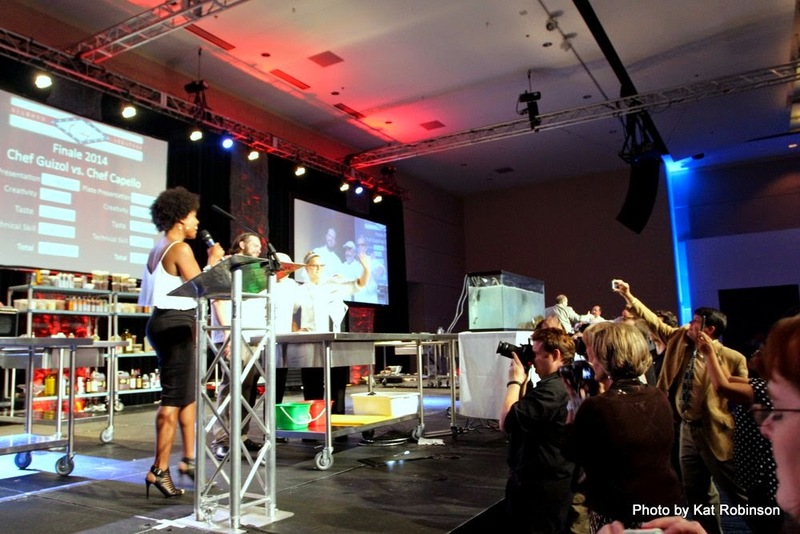 But the chefs were called back to the stage, and with the announcement of scores, the title of Diamond Chef was announced -- and this year, it was an upset, as Chef Marc Guizol defeated Chef Dan Capello. A celebratory round of photographs were taken... and as I looked by my side to the other bloggers, writers and photographers who were covering the event, I felt a camaraderie I had long missed. This was worth staying up past my bedtime on a school night. I haven't seen the final numbers yet, but I know thousands of dollars were raised for the school. That money will go to deferring the costs of attending such an amazing facility and program, and help make it easier for aspiring young chefs to learn and develop their skills in a prime environment. 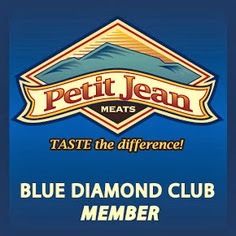 There will come another competition next spring, and the cycle of determining the next Diamond Chef will begin. As for our blogging community, I think this was an important step -- a necessary one. As Jake Blues frequently said, it's time to get the band back together. 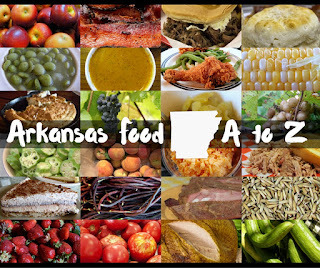 The umbrella of sharing and promoting Arkansas's foodways is opening, and it's time to step out into the rain of change and innovation that's pouring around the state right now.